The National Institute for Reproductive Health is committed to assisting advocates in addressing the deceptive practices of crisis pregnancy centers (CPCs). CPCs are anti-choice organizations that often pose as women’s health clinics, but their real aim is to dissuade pregnant women from choosing abortion. Extensive national research, as well as reports conducted in states such as California, Maryland, New York, and Texas, has revealed that CPCs regularly use deceptive and manipulative tactics to achieve this goal. Spurred by these investigative reports and resulting pro-choice advocacy, several localities have taken action to protect consumers from the fraudulent practices of CPCs by passing legislation or resolutions. Although some of these ordinances are no longer enforced following legal challenges, advocates in several cities have been successful in regulating these dangerous centers. 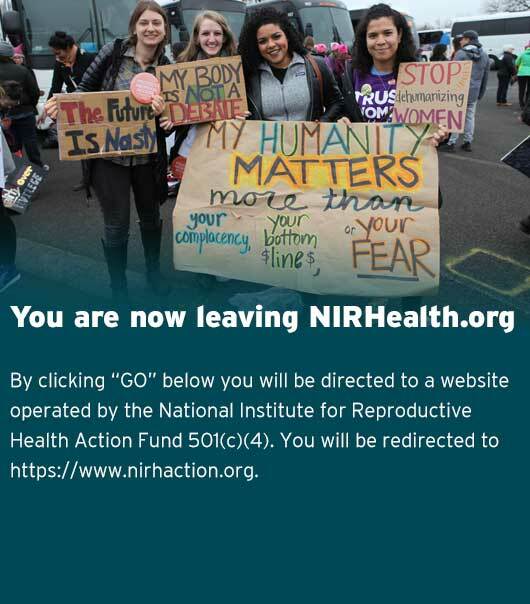 The National Institute stands with localities around the country as they fight to protect their communities’ rights to unbiased medical information and comprehensive reproductive health care, including abortion. The state of California passed a law regulating health care providers and CPCs in 2015, the Reproductive FACT Act. Although several CPCs in northern California have filed a lawsuit, claiming that the law is unconstitutional, the court has allowed the law to go into effect during the litigation. Rewire covered the latest court decision allowing the enforcement of the law. In Northern California, CPCs have sued local officials who are responsible for the law’s enforcement in an attempt to coerce them into not enforcing the Reproductive FACT Act. This targeting of local officials is a unique tactic in anti-choice advocates’ fight against the law. Read more at Lost Coast Outpost. Read more about the options for regulating CPCs at Slate. In 2010, NARAL Pro-Choice California released a report detailing the deceptive practices of CPCs entitled “Unmasking Fake Clinics: the Truth about Crisis Pregnancy Centers in California.” In 2011, the San Francisco Board of Supervisors passed an ordinance prohibiting CPCs from making misleading statements or posting deceptive advertisements about their services. First Resort Inc., a local CPC, sued the City for civil rights violations, and a federal court upheld the law in 2015. Read NARAL Pro-Choice California Foundation’s CPC report. Read the San Francisco ordinance. The New York Times covered the introduction of the bill, and Huffington Post covered its initial passage. In 2009, NARAL Pro-Choice Texas Foundation released a report that highlighted the misleading practices of CPCs, “Taxpayer Financed Crisis Pregnancy Centers in Texas: A Hidden Threat to Women’s Health.” The following year, the Austin City Council passed a resolution that required CPCs to post signs notifying people entering the center that the center does not provide abortion, abortion referral, or contraceptive services and does not have a licensed medical provider on site. Following a court challenge, the City Council revised the ordinance to remove references to abortion and contraception, requiring only that CPCs post signs notifying potential clients whether or not a medical provider was part of the center’s staff. However, in 2014, a federal court judge struck down the ordinance, ruling that it was unconstitutionally vague. Read NARAL Pro-Choice Texas Foundation’s 2009 and 2014 investigations into CPCs. Rewire covered the 2010 ordinance, and Burnt Orange Report covered the 2012 revision. View the 2010 and 2012 City Council meetings. The Austin Chronicle covered the federal court ruling and the history of the ordinance. In 2008, NARAL Pro-Choice Maryland released a report entitled “The Truth Revealed: Maryland Crisis Pregnancy Center Investigations” that highlighted the deceptive practices of CPCs in the state. The following year, the Baltimore City Council passed an ordinance requiring CPCs to disclose whether or not they provide or make referrals for abortion or contraception services. The Montgomery County Council passed a similar ordinance in 2010. Local CPCs and Catholic officials filed two lawsuits against both jurisdictions, and in 2011 a U.S. District Court blocked the laws from being enforced. A three-judge panel of Fourth Circuit Court of Appeals initially upheld that ruling in 2012. However, the case was heard before the full Fourth Circuit en banc in late 2012, and the court overturned the initial ruling on both ordinances, remanding the cases back to the U.S. District Court for further discovery. The District Court then ruled against the Montgomery County ordinance in 2014. The Baltimore case is still pending and remains enjoined until a decision is reached. Read NARAL Pro-Choice Maryland’s CPC report. Read the Baltimore ordinance and the Montgomery County ordinance. View the 2010 Montgomery County Council meeting when the ordinance was passed. Rewire covered the history of the Baltimore case following the Fourth Circuit’s 2013 ruling. In 2010, NARAL Pro-Choice New York, now the National Institute for Reproductive Health Action Fund, released a report on the deceptive practices of CPCs in New York entitled “’She Said Abortion Could Cause Breast Cancer’: A Report on the Lies, Manipulations, and Privacy Violations of Crisis Pregnancy Centers in New York City,” based on an undercover investigation they conducted with several volunteers. The following year, the New York City Council passed an ordinance requiring CPCs to post signs and otherwise disclose information about the services they provide, including whether a licensed medical provider is on staff at the center and whether center staff will refer women for contraception and abortion services. The law also contained a provision requiring CPCs to treat all health and personal information they receive as confidential. Several local CPCs sued, arguing that the disclosure requirements violated their First Amendment rights. They did not challenge the law’s confidentiality provision. In 2011, the US District Court for the Southern District of New York held that the law was vague and issued an injunction preventing the city from enforcing the law. However, in 2014, the Second Circuit Court of Appeals overruled the District Court, holding that the law was not unconstitutionally vague. The Second Circuit then upheld the requirement that CPCs disclose whether or not they have a medical provider on staff, although the court struck down the requirement that CPCs disclose whether or not staff would refer for contraception or abortion services. When the CPCs appealed this ruling to the Supreme Court, the Court declined to hear the case, allowing the Second Circuit Court ruling to stand and enabling New York City to begin enforcing this part of the law. Read NARAL Pro-Choice New York’s investigation into CPCs. Read the New York ordinance. In 2011, New York Civil Liberties Union filed an amicus curiae brief in support of the New York ordinance. Read a summary of the court cases surrounding the ordinance in the National Partnership for Women and Families’ Repro Health Watch. Read our , one of the young women who went undercover for the investigation. In 2013, the Chapel Hill Town Council unanimously passed a resolution entitled “Accurate Health Information for a Stronger Community,” supporting the right to medically accurate information in women’s health care, pregnancy, and contraceptive services and encouraging the North Carolina General Assembly to take action to regulate these centers. The resolution also condemned North Carolina’s funding of CPCs through “Choose Life” license plates, as well as an anti-choice state law that requires, among other provisions, that the State maintain a database of CPCs and provide this information on their website and in printed materials as a resource for pregnant women. NARAL Pro-Choice North Carolina supported the passage of the resolution, and Executive Director Suzanne Buckley spoke at the hearing. NARAL Pro-Choice North Carolina and the Town of Chapel Hill issued press releases about the resolution. Chapelboro covered the passage of the resolution. Read the agenda item and summary from the Town Council here, and the resolution here. In 2011 and 2012, NARAL Pro-Choice Wisconsin Foundation conducted an investigation into the practices of CPCs and released a report, “CPCs Exposed: The Truth about Deception at Wisconsin Crisis Pregnancy Centers.” In 2013, the Board of Dane County, where Madison is the county seat, unanimously passed an ordinance to ensure that the County only contracts with facilities that provide unbiased and comprehensive medical information. County officials were moved to action after learning that a state public defender had referred a minor seeking judicial bypass to Care Net, a CPC, and sought the assistance of NARAL Pro-Choice Wisconsin to ensure that this would not happen on the local level in their community. Although this ordinance will not prevent state officials, like the public defender, from making these referrals in the future, it ensures that county clients receive comprehensive, unbiased reproductive health care information from county-funded organizations. Read NARAL Pro-Choice Wisconsin Foundation’s investigation into CPCs. Read the Dane County ordinance. NARAL Pro-Choice Wisconsin released a statement praising the ordinance.